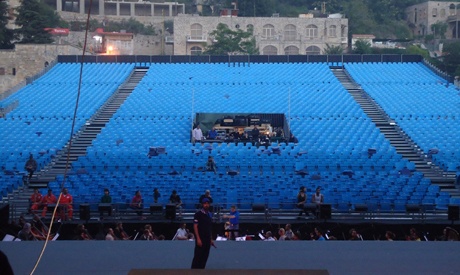 On 28 June, the Beiteddine Art Festival opens with a performance by Caracalla Dance Theatre troupe. Ahram Online spoke to Nora Jumblatt, festival president, about the renowned yearly event. For a few decades now, every year during summer, a magnificant 200-year-old palace situated in a small town in the Chouf Mountains (50 kilometres southeast of Beirut) becomes home to one of the most important art festivals in the Middle East: Beiteddine. Overlooking a terraced mountainside, the palace is an architectral masterpiece built by Emir Bechir Chehab II. In 1934, the palace became the presidential summer residence. In 1984, the palace was heavily damaged during the war and was restored on the order by Walid Jumblatt, the Druze leader, and the current leader of the Progressive Socialist Party. The Beiteddine Art Festival started in 1985 as an initiative of Jumblatt, who after the palace’s restoration began organising small cultural events at the site to small audiences. Art historian Nora Jumblatt, the wife of Walid Jumblatt, took the festival in her hands in 1987, soon after their marriage, and worked on its expansion. She became the festival’s president and organised a commitee to develop the event. “I wanted to do something special for this area and I thought of taking the event to another level,” Jumblatt told Ahram Online. “We were starting very slowly with a few activities and free entry for the public. Slowly, when the war ended, we started having higher demands. I formed a committee and we started working on sponsors and public relations,” she added. In time, the festival grew and gained international recognition. Organised in the summer, the festival usually lasts for a month or more and it can hold up to 20 music activities in addition to exhibitions in the palace’s smaller halls. “This year is bit different. We still have a festival but it is shorter and smaller, due to the month of Ramadan that will start soon,” Jumblatt explains. The beautiful Beiteddine Palace projects a lasting image of Lebanon. The historical site attracts people interested in the arts, tourists, and locals from the area. Over the years, the festival has not only introduced local audiences to countless international musicians, singers and performers — from Placido Domingo, Jose Carrera and Valery Giergiev, to Charles Aznavour, Ricky Martin and UB40, among others — but it has also attracted international audiences, arriving especially to attend events organised in the mesmerising location. The price of festival tickets today varies, with the cheapest available at $30. Some nights are free entry so all the community living in the area can also enjoy the shows peformed by renowned troupes and orchestras. This was the case of the general rehearsal of Caracalla Dance Theatre. Perfomed in almost final form, an audience of over 3000 filled the main auditorium for the night’s free entertainment. “It is great that all those people come. Many of them must find it not easy to come all the way to Beiteddin Palace, but still they make it,” Jumblatt said, adding that every year the organisers try to ensure that three or four events are free of charge. Jumblatt invites young musicians from underpriviledged families to perform on the festival’s main stage. A concert on 14 July will see 60 students aged beween 12 and 15 perform under the wings of an association for financially underpriviledged families. The concert will be free of charge. “Culture is only interesting if it goes down onto the street, if it can reach the layman, if it can reach people of all walks of life. Art is not only for the elite, it should not be reserved for the elite,” Jumblatt adds. Between 28-30 June, Caracalla Dance Theatre will perform Once Upon a Time; on 7 July, the festival will host Sylvie Guillem and Russell Maliphant with their contemporary dance performance Push; on 12 July traditional Tarab music will be the focus with Hamam Khairy presenting a combination of Arab and Andalusin songs; on 17 July jazz will take to the main stage with Randa Ghassoub; and on 26 July the opera La Boheme will be performed, coming straight from Orange in France. This year, the well-known rock group The Cranberries were slated to perform at the festival but the concert was recently cancelled. The festival will also include photography exhibitions. For detailed information about the Beiteddine Art Festival, visit this link.